Automation Workshop features a powerful free automatic email sending tool. Send email Action can send email to one or multiple recipients in fully automated manner. It features all important email sending capabilities including custom headers, advanced SMTP server configuration, SSL and STARTTLS encryption, .EML file creation, SMTP communication session logging and more. When it comes to automation, email support is important part of the software. Automation Workshop Free Edition provides all necessary features for sending emails in simple or advanced contexts. Whether You need to setup newsletter distribution, send confirmation of some process completion, or deliver files over email, the Send email Action can take care of it. Send email Action particularly excels at sending personalized emails both in HTML or plain text with recipient-specific attachments, if necessary. Email can be conveniently sent to one or multiple recipients. Compose subject and message by using both fixed text and variables that change values depending on particular context. Choose from which address to send emails, add a quick attachment and you are almost done. Attachments are comfortably added when necessary. Automation Workshop can handle large volumes of files regardless of their size and numbers. Flexible specification options allow to intelligently choose what files will be attached when sending email. Headers allow to send carbon copies and blind carbon copies to 3rd parties. Set the Reply To address if you want replies coming to different email address. Fill in the organization field and, if necessary, insert custom tags or text values in email header. Server settings include automatic detection of authentication type, secure and regular connections. Communication sessions can be logged for further troubleshooting. Automation Workshop works perfectly with default specified SMTP server. If necessary, however, each Task can use a different SMTP server. 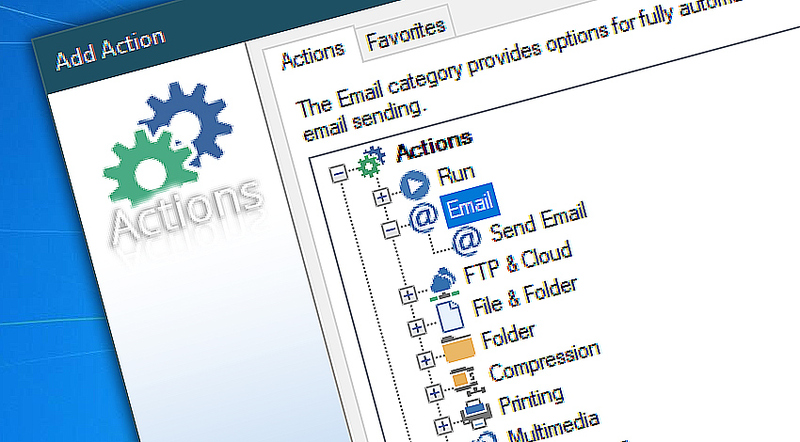 Advanced options expands the capabilities of email sending by adding .EML file creation option for saving the message for later use as well as adding client / SMTP server communication logging for detailed overview and troubleshooting. Options allow to decide between plain text and HTML message format, choose character set for proper encoding in different languages and set the message priority from low to high. Choose whether you want the email delivery and reading confirmation, and whether each recipient should receive his message separately from others. Messages can be checked for availability of all specified attachments before sending. Errors are returned when email sending fails. From connection problem to inability to add attachments, choose which errors that will automatically start On Error predefined response. Disabled errors are considered to be successful terminations. On Error specifies what to do when Send Email has experienced an error. Whether it is necessary to try sending email again, alert system administrator, or starting / stopping some Task depend on context, but with this pro-active error management system you can solve or workaround most problems. Overview · get acquainted with Send Email. Email · learn to specify sender, recipient, subject, text and attachments. Attachments · work with attachment rich emails. Headers · specify carbon copies, blind carbon copies and custom headers. Server · use default server or choose a different one for this particular Task. Advanced · on client / server communication logging. Options · from message format and character set to confirmations and individual delivery. Errors · on monitoring Send Email for errors. 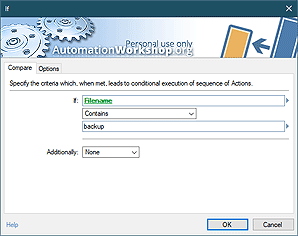 On Error · setup pro-active error management to solve or workaround problems automatically. Automation Workshop is a great product — I love it. —Glenn N.